Robinsons is slowly becoming one of my favorite destinations to shop at. The other day my mum and I went shopping for a dainty gift for one of her friends. I happened to wander off and ended up admiring the beautiful Alexander Wang shoes on display. I wandered off a little further, tried a few fragrances and discovered how much I love YSL's Black Opium. There's something about this fragrance that gets to you right from the first spritz. Of course Robinsons has a gorgeous collection of gowns and dresses. I have 2 gowns that I have yet to wear but wanted that one dress from Poca and Poca just because "it's so pretty". Alongside the gowns is the new modest wear collection. 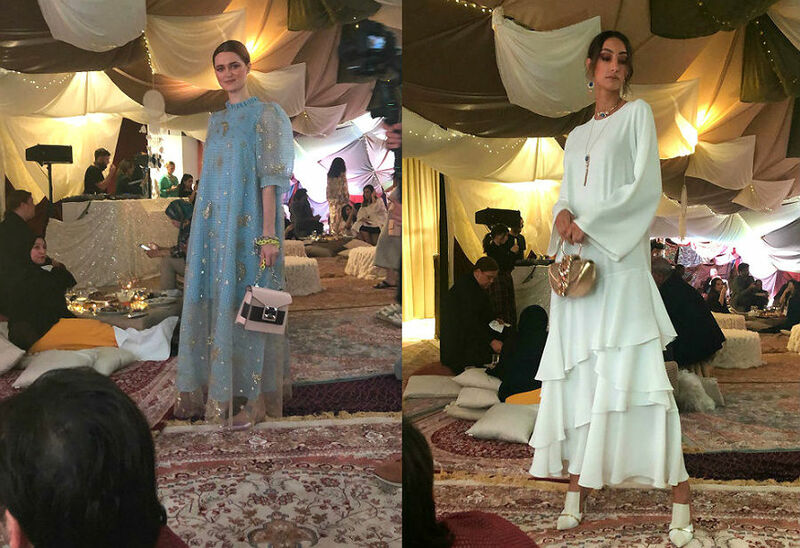 Just in time for Ramadan (and Eid), the collection features an array of classic designs and elegant pieces. I attended the launch that was hosted in an intimate setting with a beautiful Bohemian feel to it. The luxurious Ramadan collection features abayas, kaftans, jalabiyas, modest dresses combined with designs reflecting current and emerging trends. 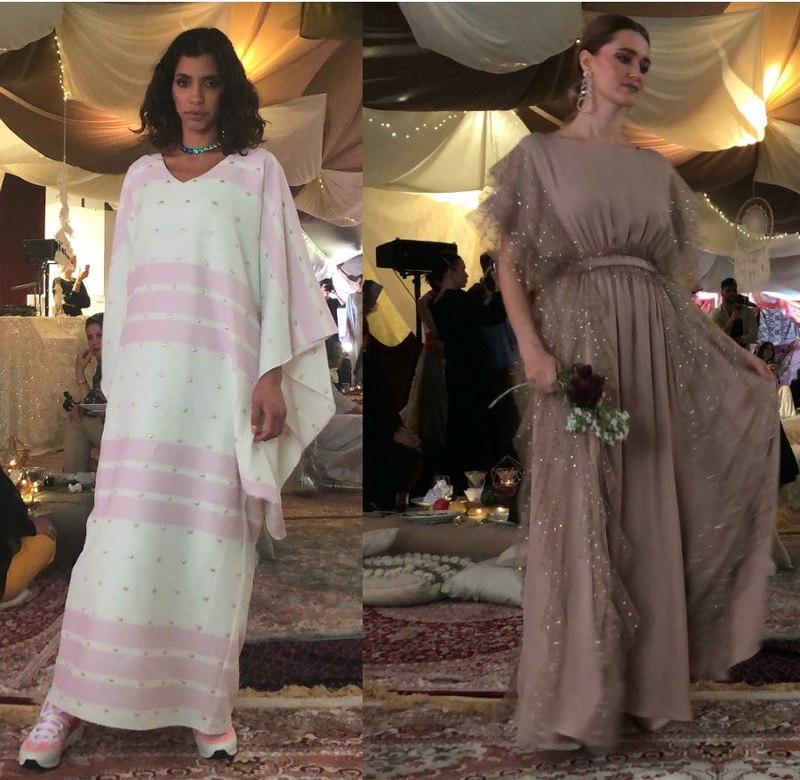 From brands and designers such as Bambah, Dima Ayad, Anatomi, Hessa Falasi, Endemage, the elegant and feminine pieces mirrored the chic style of the Arab world. While certain designers incorporated traditional patterns, the others paid homage to the West bringing in ruffles and lace. With flowy, silky textures and intricate detailing when it comes to embroidery, more than a handful of pieces from the collection made it to my wishlist. There were a few in particular that I fell in love with and they emulate the current color palette in my wardrobe. How beautiful are these? The blue tulle dress with the celestial detailing and the bag paired off with silver chrome flats is my favorite. And the white is equally beautiful- love the tiered ruffles and the fall of the fabric. While I love the ultra-feminine touch to the design on the right, do you spot the innovative pairing on the left? Sneakers! I'm not a fan of this look but I quite like the cotton candy color palette match! With this and brilliant accessories from delicate earrings to statement necklaces and pendants, this collection has you covered for Ramadan (and Eid!). Robinsons 2019 Ramadan collection is now available in store.